"What time does the Caf open?" "What restaurants deliver to Samford?" "I'm planning a road trip, how long does it take to get to Florida?" Ask any Samford University student where they find the answers to these questions, and they won't tell you they Google it or send a text to ChaCha. Instead, Samford students call the HUB, Samford's 24-hour, seven-days- a-week source for information and answers to almost any question. In fact, the HUB's telephone number -- (205) 726-2407 -- even reflects its 24/7 mission. The HUB began operation in fall 2009 but was preceded by an information center that operated during regular business hours Monday through Friday. In 2008, the division of operations and planning saw a need greater than what the information center could provide. "We realized that our campus does not operate on an eight-hours-a-day schedule. The campus has activities and needs at all hours of the day and all days of the week," said Lauren Taylor, director of residence life and university services. At its conception, the HUB did not have a name. In fact, "The HUB" name was given to the new information center by a student writer in the Samford Crimson, and the name stuck, said Taylor. While the HUB began as a 24/7 service for answering questions, the information source has evolved since its opening. Today, The HUB processes after-hours maintenance requests, is the check-out point for Samford's bikes provided by Regions Financial Corp., and is the pick up place for parking decals and packages. The HUB is also the point of contact during emergency situations. "Often when most of the university is closed, the HUB is still operating and updating the Samford community on inclement weather or other concerns," said Jennifer Novotny, university services manager and director of the HUB. Novotny, who oversees the daily processes of the HUB, believes the HUB plays an important role not only in emergency situations, but also as a customer service to the university. "I think it's a comfort to students and parents alike to know that there is one central place that can either directly help with their situation or get them to the people who can," Novotny said. 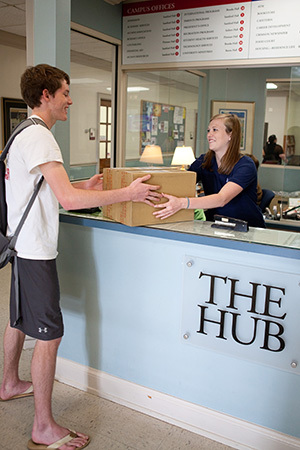 Although Novotny oversees the daily operation of the HUB, she described Samford students, who staff the HUB each day, as the "hands and feet" of the information center. "What I think really makes the HUB special is that it is the students that make things happen." Novotny said. "The fact that the students have such an influential role in the operation of the university is something that is unique to the HUB." Jasmine Swift, a junior marketing major and student employee at the HUB, said she has learned more about Samford and gained valuable phone etiquette skills from her work. Not only do student workers learn more about Samford, they also learn important lessons in customer service and flexibility. "The HUB is a great place for anyone to learn how to interact with a wide variety of people in a broad range of circumstances," Novotny said. "You have to be flexible and learn to think on your feet at the Hub, because you really don't know what each day might hold." What's next for the nearly four-year-old HUB? Novotny believes the possibilities are endless. The HUB is looking to increase its presence as a source of information on social media and recently joined the Twitter world (@TheHUBatSU). Whatever may be in its future, both Taylor and Novotny agree that the HUB has far exceeded their expectations. "When the idea of a 24-hour a day service center was first discussed in 2008, I don't think we realized what an integral part of the Samford community the HUB would become," Taylor said. Bo Morris is a senior journalism and mass communication major and a news and feature writer in the Office of Marketing and Communication.